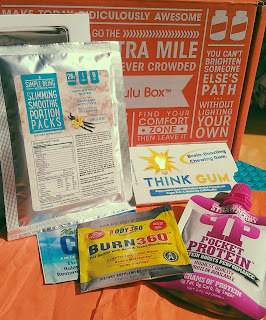 My second Bulu Box has arrived. I can't lie, my weight loss progress has been at a halt. Suddenly life took a big old dump on me and I let that bog me down. Getting this box reminded me that maintaining isn't enough. I need to get back on track so hopefully I will! Not entirely happy with a two caplet sample. I could have probably gone to GNC and gotten this same sample for free with my GNC card which I pay for. I'll give them a try, but Bulu needs to step it up. This is not a premium sample. It's a pretty standard protein, my flavor was vanilla and it was good. I do like that it's only 110 calories that's a good calorie count for a protein. I like it, it won't replace what I'm using now though. Again, the size on this sample is not impressive. 1 packet? I go right back to my GNC membership, hell...honestly if you just go to GNC and are looking for free samples you might get this... I PAID for it! Come on Bulu...come on. Anyway I gave it a try. I have to say the taste wasn't so offensive but I'm not very sure about the effects. It's said to balance the magnesium levels in your body. I'd like to have been able to try it a few times to see if I found a difference, but...one packet. A really pleasant tasting gum. Peppermint and a hint of rosemary. It claims to boost memory by 25% when chewed during studying and then again to recall information. I like the gum...but the price tag is WHEW too high. Ringing in at $22.00 for a twelve pack box...OUCH. No thanks. The recommended use says that you should drink 4 servings a day. I got one. Just saying...maybe give me a days worth? After getting this second installment of the Bulu Weight Loss Box I'm not impressed. I'm going to see how the next box goes and if the third time isn't a charm I will be cancelling. I'm not seeing the value in it. Not even for $10. Never heard of them, but need to work on my weight. I can see why you feel that way. If they want you to really see if products like these are worth purchasing, they need to give you more than a small sample. This is the first time I have ever heard of Bulu But I will definitely keep an eye on your posts and see if it ends up being worth it or not. This box looks great!! Finally a box a man can use LOL!!! First time i've heard of it too!! I have never heard of Bulu before! I am def. going to check them out!